True ownership of one share of Twitter stock framed like you want. The recipient becomes a real shareholder of the company. Important Note: As of late December 2013, Twitter decided to NOT issue paper stock certificates and registers ownership electronically instead. The recipient still becomes a real shareholder of Twitter, Inc. with all associated rights. Although it's a replica, it's beautiful. 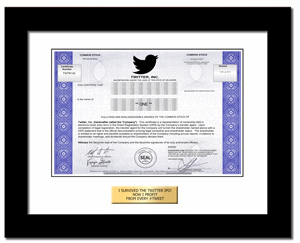 The Twitter stock certificate is strikingly ornate incorporating the company's name and famous logo. A welcome addition to any decor and a cool conversation piece! Twitter is a real-time information network that connects you to the latest stories, ideas, opinions and news about what you find interesting. All in 140 characters.